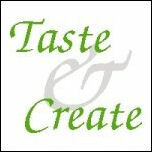 For this month's Taste & Create, I was paired with Shilpa from Passion + Love + Patience = Good Food. Shilpa is not one to write loads of waffle on her blog, she gets straight down to the nitty gritty of posting lovely, spicy, interesting recipes. I found it easy to choose something tasty and healthy, but after browsing her blog, I knew that she would probably have quite a hard time choosing something from my sugar laden pages. 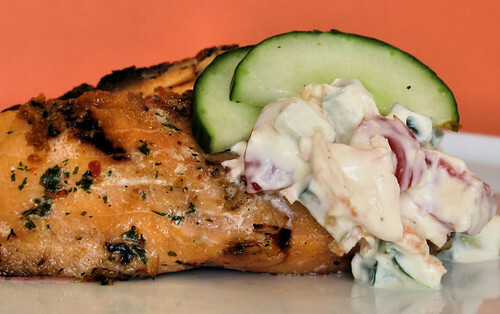 Grilled salmon with raita is a light, fresh tasting dish. The raita is healthy and delicious, bursting with spicy, crunchy flavours. I grilled the salmon with a little honey, olive oil, some chilli flakes, lemon juice and parsley. I followed the recipe exactly for the raita. Thanks for the recipe Shilpa, and thanks to Nicole from For the Love of Food, for all the work she does in co-ordinating this fun event. Mix all the ingredients for the raita in a bowl. Serve with hot grilled salmon. Oooh YUM! That looks good - I really like that recipe for Raita too! What a lovely looking meal, Nic. Nic, we love salmon here and that looks really, really good. I love the sound of the raita and the salmon together. Thanks for a great recipe! Oh boy! That salmon looks delicious! The raita sounds like the perfect accompaniment! What great appeal - I love the freshness of the ingredients in the raita - a nice compliment to the salmon. I love this event Nic!!! Excellent choice with the salmon and raita!! This is one flavorsome plate of food you have here. Nice contrasting flavors and textures. This is a lovely meal with great texture, like Nina says!..the salmon with a perfect matching raita! Nic, that looks so fresh and full of flavor! GREAT one Nic...the fish looks delicious & must have paired really well with the raita. You can even add some fresh chopped mint leaves into the raita & chill it for a while to let the flvaours marry. Very refreshing! That sounds incredible! I love salmon, seriously my favorite fish, this is one dish I'm definitely bookmarking! I really enjoyed making this, sometimes I think I do too many sweets on here! That looks great! Fabulous to check out a new blog! So simple! I love the recipe! oh i know what you mean...i have a pang of guilt when someone into healthy eating gets me as a partner. i on the other hand love the tips for lighter food. this recipe you chose looks like a delicious dinner! Waiter, there's something in my... malt loaf!